Excellent Jenna. I love the image (intimate landscapes are among my favorites). I like your choice of DoF especially, and the vignetting works very nicely. Excellent image! Especially for someone not all that keen with landscapes… But shows me you have a keen eye and understanding of selective focus. That and the vignetting really take this beyond just an ordinary photograph. Very well done! And yes, sometimes nature does all the arranging! A very evocative image. The shallow depth is nice but my landscape background wishes for a little more sharpness on the closest leaf. Otherwise its a photo that send me into a contemplative mood, looking for something although not knowing what I am looking for. You might not have looked for this image, but you certainly SAW a very special scene here in this photograph. The bright colors of the leaves combined with the vignette effectively directs the viewer’s attention to the most important part of the frame. 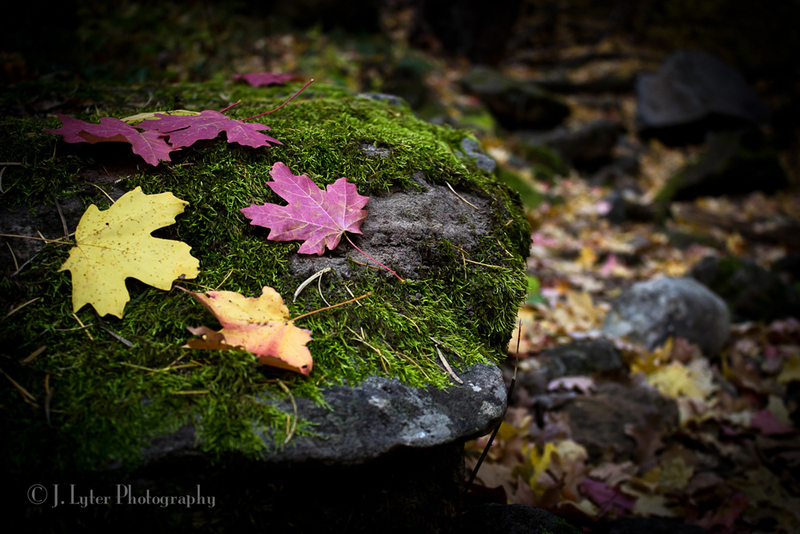 I agree with Youssef’s assessment – though I enjoy the shallow depth of field, I, too, would like to see that front leaf in sharper focus like the other leaves on the rock. That said, you’ve done a wonderful job evoking a peaceful, autumn feeling here. Oh, and the title fits perfectly!